In partnership with adidas, the US Soccer Foundation, and The Red Eye Foundation, artist Geoff Gouveia was recently commissioned to paint a mural unlike any he had previously done — a futsal court. We spoke to him about how he was able to secure the project, the unique challenges that it presented, and his brief run-in with Kris Jenner along the way. For artists, consistently pushing the boundaries of their work can prove to be an essential challenge they must face on a daily basis. 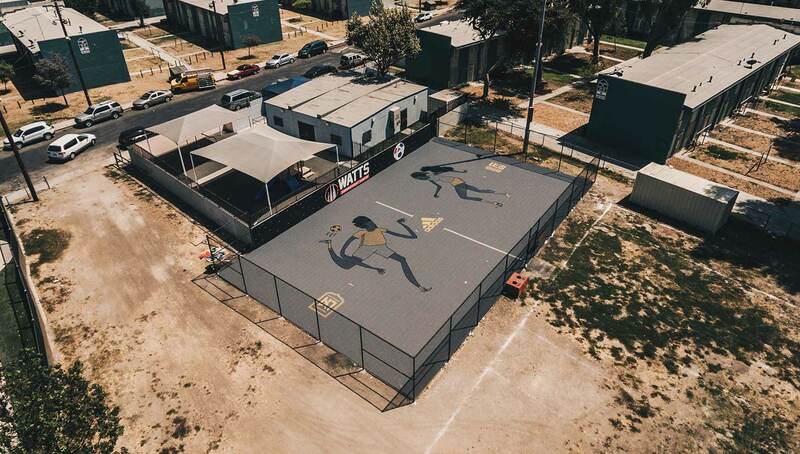 Southern California artist Geoff Gouveia faced and conquered this challenge upon his completion of his futsal court mural at the Watts Empowerment Center. Through some impressive networking within an intricate web of corporations and foundations, Gouveia was able to get the project paid for, and himself paid, while also spreading his art into the soccer world in a practical and fully-functional way. While he has done countless murals in the past, switching from a horizontal to vertical perspective brought in a new set of challenges, whether it was making sure the scale of the mural was accurate or that the court itself was playable. Using a mix of math, chemistry, and brief run-in with a Kardashian, Gouveia’s recent endeavor was a fascinating story and another successful undertaking from the one-of-a-kind soccer artist. Ahead of the court’s grand opening on October 13, we spoke to Geoff about the biggest challenges he faced for the first time during this epic project. Urban Pitch: So how did this whole project come to fruition? Geoff Gouveia: This project has a ton of moving parts and it actually began last year in Chicago. I was partnering with Trisikh Sanguanbun from Turf Mapp. 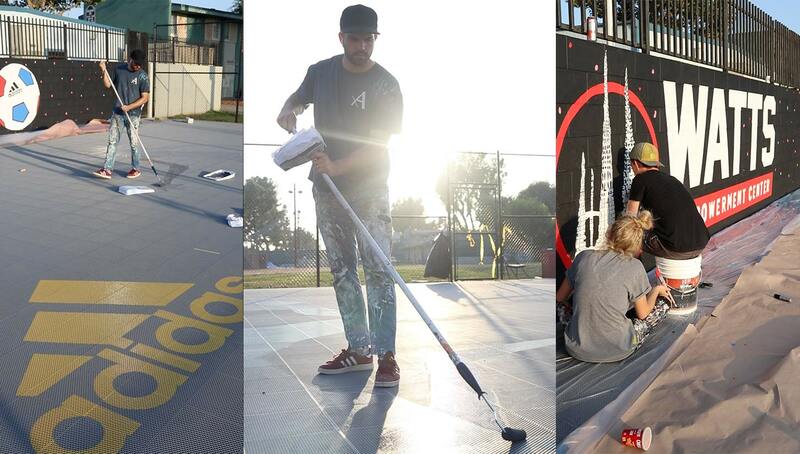 He flew me out to Chicago and I was supposed to paint a court for a project he was doing with adidas. At the last minute the owners of the facility said that it was a liability issue with painting the ground. So I’ve had this chip on my shoulder to paint a court for over a year now. The reason I started doing murals was because I love people interacting with my work. What cooler way to interact with the work than literally playing on top of it? The court in Chicago fell through, but then I heard that the US Soccer Foundation was partnering with MLS and Target on this Safe Places to Play initiative. 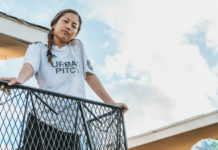 They’re trying to build 1,000 small-sided pitches in lower income and inner-city areas by 2026. They wanted to do something cool for the communities and they wanted to do a marketing initiative. They wanted to have a pitch for a safe place to play and so it all just came together. 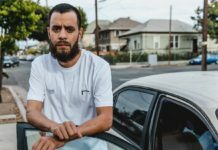 I had to go through several rounds of designs and made sure that it would fit the community because if you’ve ever been to Watts — there’s a huge, huge sense of community. Anything that’s going up in their community has to feel like it’s from the community. So I really had to to keep that in mind as far as what I was designing to really make it special. I wanted to do two characters that were both male and female. For the male, all I really wanted was the hair of Marcelo. I thought as long as I do a character that has Marcelo’s hair — I’m golden. And we did the pitch! Technically, what was it like painting on the ground? The actual painting of the pitch was really, really difficult. I’m 5-foot-9, you know, a stereotypical soccer player. That means that you have the perspective of standing five feet away from a three-story wall while you’re painting it — you’ll never be able to really get a good perspective. I had to mock up a design on my laptop and then I had to convert it to scale by hand, so every inch of my laptop was equal to about 16 inches in real life. It was just like playing Battleship, calling out coordinates to my team saying, “OK Taylor, you go 60 inches right and 200 inches north,” And she would walk that path, put a point down and then I came back and drew the characters basically by plotted point, if that makes sense. They’re basically just dots on the ground that signify where is an elbow, where is the hand, where is whatever. What was that your first time having a draw like that? In some ways this audience was probably going to be my most critical because kids don’t care about your feelings. They’re just like, “Yeah, this looks dumb.” Or like, “Why is it like this.” They’ll tell you how it is real quick. And I was really trying to hit that mark by making sure all my bases were covered before moving on. So are you telling me you really used math from high school? I was actually. I was using a lot of basic fractions and a little of algebra, just calling out for the plots. I mean, I became an artist, but I was actually pretty good at math in high school. I got all the way to calculus and I liked it, I liked that side. But there is also a lot more math that goes into every mural than most people think. And you’re constantly having to keep figures in your head. You’re constantly spacing out what’s going on, and if you don’t remember those things, then you’re going to be screwed. How did you decide what actions to give your two characters? Yeah, that is a good question. I guess that the cliché thing is, anytime someone deals with soccer, it’s like, “Let’s do a bicycle kick.” I actually think the move that seems really fresh to me is the scorpion, like the Giroud or the Mkhitaryan scorpion. That move seems to be the most 2018 way to score a goal. I’m sure it’s been around for a long time, but it just seems to keep coming up. And to me that’s the coolest move right now. So I really wanted to show a guy with Marcelo-type hair doing the Scorpion kick. And then for the second character, the female, I really just wanted someone who had just passed the ball and is looking out and surveying the field. So it was one extremely unrealistic move that you never do and one that’s a lot more practical. This couldn’t have only been a one-man job. Did you have a team working with you? I have three assistants — Taylor Hatch, she’s the one who helps me a lot with my murals and then I have Andrew Perkel and Jake Driscoll, who does a lot of my videos. He also helps me with the murals as well, so Jake was splitting time between filming and doing the mural. I painted a #mural on the floor of a new court @ussoccerfoundation, @lafcfoundation and @adidasfootball created in #LosAngeles for @redeye’s #WattsEmpowermentCenter. Huge thank you to: Rob Kaler and the whole US Soccer Foundation team. @Vanessa_h_bump, @taunadean from Adidas (as well as @ecgail for the clutch introduction 🙌🏽). Sport Court for working with me on this unusual idea. @redeye for the inspiring huge heart they have for the community of Watts. The community of Watts themselves for the love and bomb pozole (@gabriel_mendozaa). My amazing assistants for their great attitudes (even as I neared my breaking point at the crazy challenge of scaling something on the ground) @taytayhatch, @jakedriscoll_ (who also threw this rad recap video together) and @_pirkle. The homie @ts_xiv got me amazing drone footage to feature as well. Very thankful this project even happened!! How long did the whole thing take to finish? Well, because it was an adidas community project, they wanted it done in a total of 48 hours. But because I made a mistake I had to finish on Saturday. So we started on Monday night and I finished Saturday night. What was the mistake? I hate to press you on this, man. In every mural there’s always mistakes. It’s just easy to correct them. If I overextended a line or I painted the color wrong in a certain point, it would be super easy to fix on a regular wall. But anytime you do something you’re going to make a mistake, and that’s fine, but when you have the added pressure of not having a chance to correct it — that adds another layer of difficulty. Anything unusual happen while you were working? Yeah, she was like, “So what is the court about? Why are you doing this?” It was for her show — whatever show she is in right now, I don’t know. It was all super quick. Like I’m sure she has no idea or really cares about soccer. But she’s super nice. It was just really random. I’m sorry, can you connect those dots for us one more time? So is she connected to US Soccer Foundation somehow? So there’s so many organizations involved in this. So US Soccer Foundation partnered with adidas to paint the court at the Watts Empowerment Center, which is run by The Red Eye Foundation. There’s so many layers. The Kardashians are one of the biggest donors to The Red Eye Foundation. It’s the reason why they’re able to do so many cool things, because the Kardashians just really hook them up. The center is decked out with TVs, furniture, and all this rad stuff that you wouldn’t expect in a community center. What was it like talking to someone like Kris Jenner? Did anything she do or say stand out to you? Yeah, it was like 94 degrees and she was in a full adidas black jumpsuit. Like tracksuit. Like there is no way this woman is comfortable right now. Everyone else is sweating around her, including me! That’s insane. I was not expecting the story to take that turn. Congratulations though! You’re really brushing up against some serious movers and shakers, there’s got to be a lot of money involved in that. Yeah, there was a lot of money involved in the project. I didn’t make a ton on it and it wasn’t about the money for me on this project because I really wanted to be aligned with this initiative. The Safe Places to Play thing is really cool. I would love to be able to partner more with the US Soccer Foundation on designing more pitches. They don’t necessarily all need my characters. But I think it’d be cool to design them because when you look at most of these pitches that are built, they usually do two colors and it looks OK. But to me it’s not very creative. 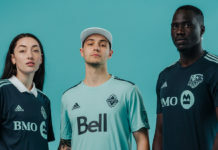 It’s basically like a kit template and it’s frustrating because it’s like, “Oh, well we got one too, but it’s in red and blue as opposed to yellow and black.” I think they should take the vibe of the community. 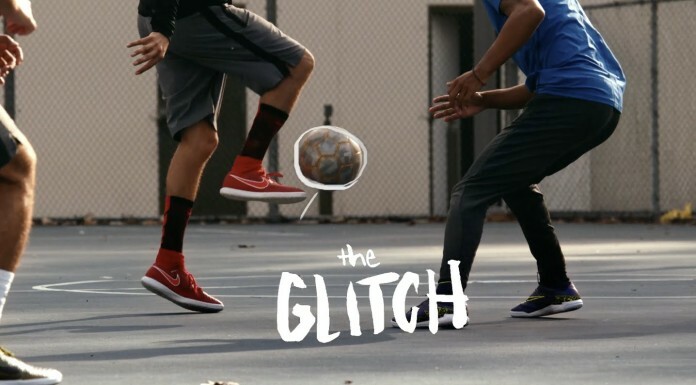 I think that will get kids not only excited to play soccer, but to think more creatively. Do you think art can be a force that links people up with the game? I think it’s the opposite. I think that art could be a way to show people a future outside of sport. A lot of people who play sports full time, when they go to school, they become like a physical trainer or whatever and maybe that’s not the best thing for everyone. Maybe there’s a way to still be within sport but to have a little bit different of an outcome. 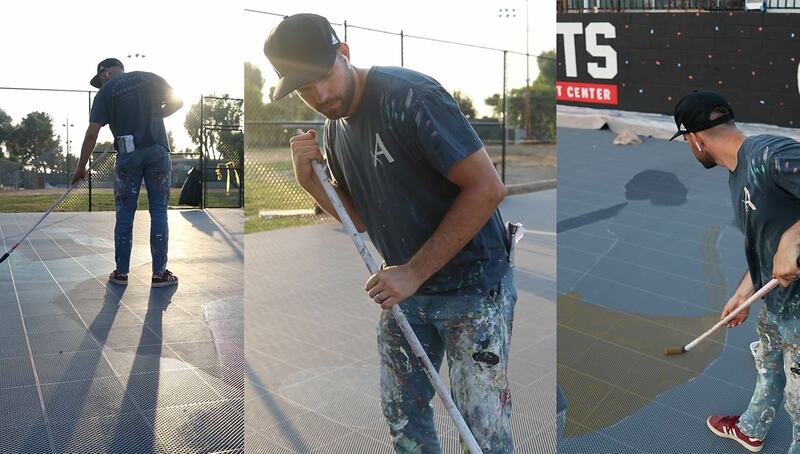 Your idea for painting on the court, where did that come from? Nobody. Nobody was thinking that this was even possible. They didn’t come to me saying, “Hey, we want to paint the court.” I went to them and said I’m interested in painting the court, I think this can be done, let’s do it. And it was adidas believing in me to say, “Yeah, you should trust this guy.” And then US Soccer Foundation wanted to see a mock up, which they liked, and they just trusted that I could pull it off. Brilliant man. That’s how you do it! Yeah. I mean, ideally that’s how it’s done. Where you really have an idea and you build the relationships and then the people who are making those calls hopefully trust you and then you just make it happen. That’s really a hard thing to do. And so that’s why it also felt surreal that these people trusted in my vision. One of those courts has to cost at least $50-$70,000. For them to say, “Alright, and then on top of it we’re going to let this artist kind of do his thing,” It was special. They’re making a $70,000 bet on me, and that took a lot of pressure. The pressure is always inherent though. It’s always going to be there and that’s something that I thrive on. But it is something that you have to consider. Yeah. And did you do all the research when it came to figuring out how you could turn that paint slip-resistant or did somebody help you with that? I just knew it was possible because if you’re able to do a logo, then you can do a painting. It’s the exact same process. So I just asked Sport Court how they did it and they have this additive that’s crazy expensive. A normal gallon of paint costs $35. One of those gallons costs $300 so it’s just stupid expensive, but it works. And you’re not worried about slipping from the painting at all? There are certain colors that are glossier. And then also the amount of coats you put on it will make it more slippery. But I’m actually not worried about the slippage on that because when I was looking at it, the way they do the logos is they spray it and they’re essentially putting like five or six coats of paint when I was only putting two or three. So it’s much closer to the original surface. I think the reason why you slip is because your foot leaves the plane of the actual court and so you’re on top of that plastic paint and that difference is what makes you slip. So mine is less paint and I don’t see it being an issue. The playability is the most important part, right? Just to close things out, what’s your big argument for why soccer needs more art? The reason soccer needs more art is because the culture itself is too dependent on the team-specific brands. If you look at a team, it’s just a brand. So if we’re going to base creativity just on branded work then it’s going to become quite stale. I mean, Manchester United has an agenda and they want that agenda to be red and white. So, if you look at it through that lens, the way that soccer can really grow from a creative standpoint is to break out of making everything team and player-specific. And if we do that, then that boosts the game from more of a cultural standpoint. Soccer isn’t just about “Hey, we like Manchester United,” or, “We like LAFC.” Instead it’s, “No, we love the game and we play the game because we love it.” And that is a lot different than supporting a brand. This interview has been edited for clarity. Be sure to keep up with Geoff’s art journey by following him on Instagram.